As one gets older (and that’s the plan, remember?) one finds oneself with what you might call “obsolete skills”. For instance, while I am in charge of de-jamming and refilling the multi-use colour photocopier at work, I also carry in my brain knowledge on how to run a Gestetner machine. If you are about my age you will recall the sound of the drum whooshing around, the smell of the duplicating fluid and the sight of purple-printed pages heralding a class hand-out or exam. I don’t need the ability to run one of these machines, just as I don’t need to know how to send a Telex, or operate an old-fashioned switchboard. But the knowledge remains, crammed into a little corner of my brain. Technology has made a huge difference in the way we disseminate information–we have to constantly learn new skills to keep up with it. But in the home these changes are not as apparent. The vacuum of my childhood might have been an ancient Kirby bought from a door-to-door salesman, but it worked the same way my new built-in does. 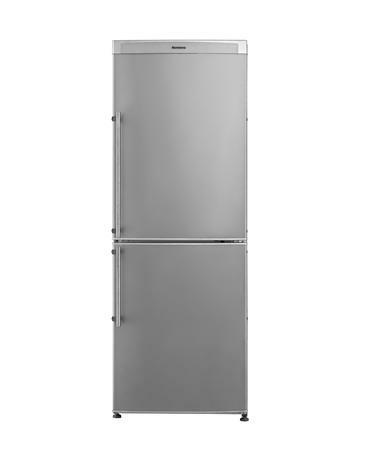 The fridge defrosts itself, but it still cools stuff like our old round-shouldered Kelvinator. The only domestic chore that has completely changed is the way we wash our clothes. I was pondering this fact the other day, as I loaded sheets into a machine that will weigh the load, adjust the water level, and deliver clean items painlessly and surprisingly noiselessly. I want to pay homage to the home makers of the past, and to this very important talent that was once such a difficult and time consuming task: to keep the family’s clothes clean. Because everyone changed their sheets on their beds on the weekends, Monday was wash day in our home. Yes, all day Monday. Set aside at least 6 hours, because you are doing a whole week’s worth of laundry. Separate the laundry into whites (sheets and towels), brights, darks, and dirty (Dad was a blue-collar guy, his clothes got dirty). 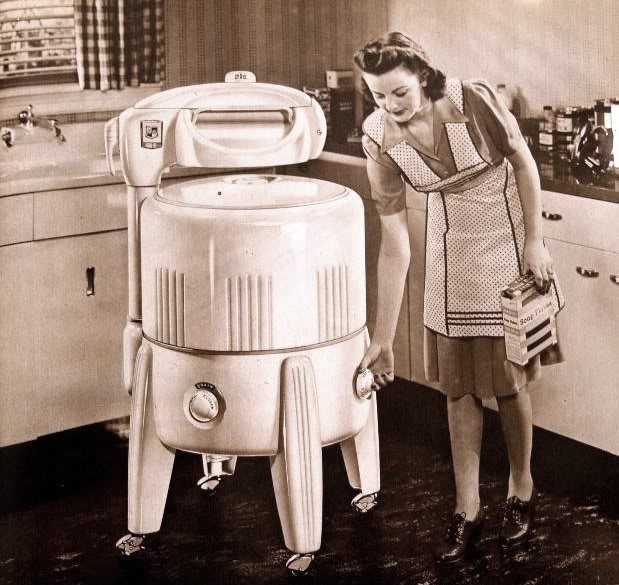 First the washing machine would be rolled to the sink. We had a basement, and big double concrete sinks, so that’s where the washer would be placed. A hose attached to the faucet fills the machine with straight hot water. Put in the detergent and let the agitator mix it into the water, then start the wash.
First load: sheets. Set the timer for 20 minutes or more (depending on how dirty the clothes are) and go and do some baking or cleaning or God forbid write a letter or have a cup of tea. When the timer goes off, go back downstairs, swing the wringer over one of the concrete sinks that you have filled with rinse water, and then feed the sheets into the wringer so that the soapy water runs back into the washer. While the sheets sit in the first rinse, put in the second load. After swishing the first load around in the first rinse water, swing the wringer so that it sits between the two concrete sinks. Feed the sheets through the wringer into the second rinse so that the soapy water runs back into the first sink. Empty that sink. Rinse it and refill with fresh water while you wring out the items for a second time and load them into the basket to hang up outside (if it’s sunny, even if it’s freezing out there) or in the basement on the clothes lines especially installed for the purpose. When it’s time to wring out the second load, put them through the wringer into the second sink — thus the second rinse from the first load becomes the first rinse of the second load. That way you conserve water because this method uses a lot of water. And you rinse in cold water because hot water costs money, kiddo! As the saying goes, lather, rinse, repeat. All day. Put in more water if it gets low in the washer, but it will get progressively more grotty — that’s the way it is. Put in more detergent if you add more water. Do the dirtiest clothes last. As each load is finished and wrung out, carry the heavy basket of wet things to the back yard and reach into the basket and lift and pin the item onto the clothesline so that it will catch the slightest breeze and dry. It sounds like hard work because it is. It’s a lot of stooping and standing and carrying heavy loads. In the winter your hands will get very, very cold. Eventually the last load is finished and it’s time to empty the washer (we used a kind of siphon that Dad had hooked up to the washer so it could empty into the sink). That lady in the picture above? She had to open a spigot in the bottom of the tub to drain the water into a bucket which she would then empty into her sink. 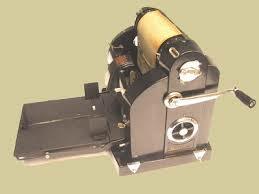 And that button on the top of the wringer? That’s to release the rollers when your child tries to help and the rollers grab her hand and pull it through the wringer up to her elbow. Ask me how I know about that. The pressure on the rollers was adjustable, too, so you could fix it according to the weight of the fabrics being wrung. Now remember — the laundry must be whisked inside off the line at the first drop of rain. And you must bring everything in before the dews of the evening make it all damp again. Fold and put away the items that don’t need ironing, underwear, towels, dish cloths. Put the items that need ironing into the clothes basket. That’s for tomorrow. Posted in Housing, Laneway House, Life, Minimalism and tagged Lane Home, Lane house, Laneway House. Bookmark the permalink. Affordability? It’s a relative thing. I don’t ski on the local mountains in the winter, I don’t wake board in the local waters in summer. I live in Vancouver because my family is here. So I’m paying for those amenities that draw people to the area even if I don’t use them. 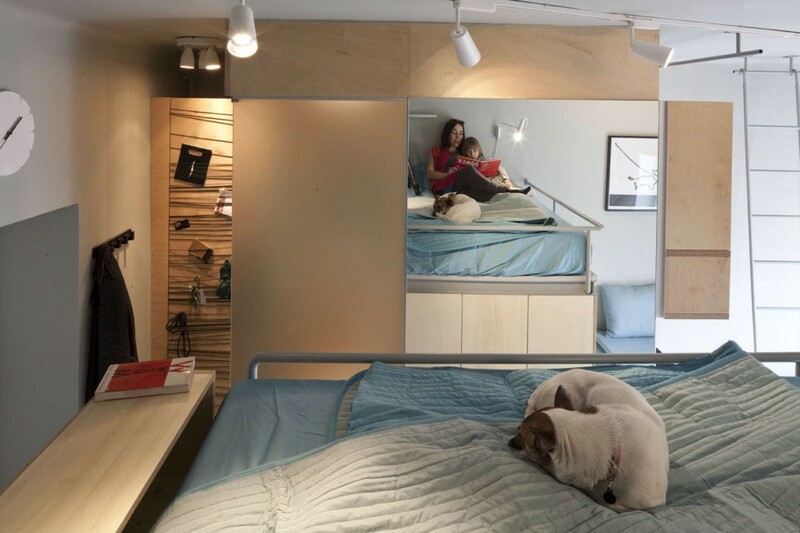 But we have found a way to live in a comfortable home — our laneway house. It’s the smallest place we’ve ever lived in, but for us it’s a perfect solution to the dilemna. I don’t expect you to wander the streets until you find a nice yard and ask the people if you can build a laneway house in their garden — laneway living is one solution, it’s not the only solution to the housing squeeze in the Metro Vancouver area. The sad truth is that if you move to Vancouver you are going to be paying more — maybe a lot more — for housing than you would in another city, which means you will probably have to downsize (one bedroom to studio, etc.). But there are still ways to make an attractive and comfortable home with less space. 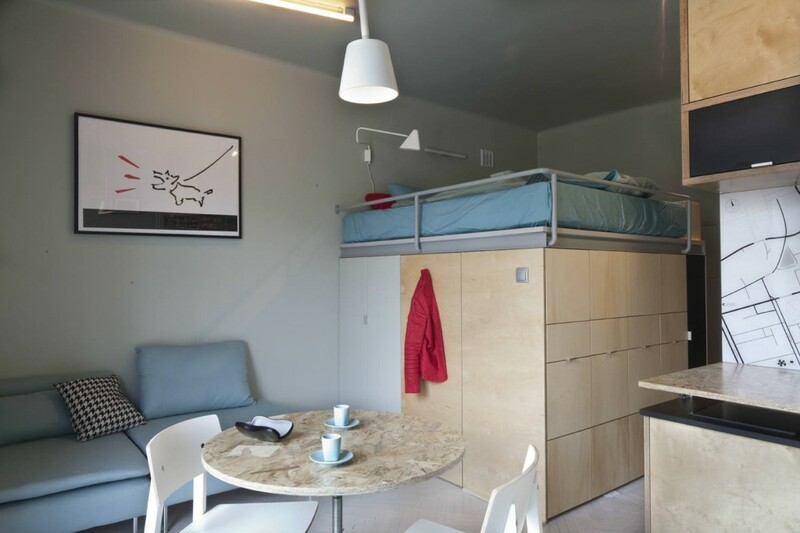 Today we have a few ideas for living comfortably in a studio apartment. They are sometimes called bachelor suites — another term for a separate dwelling with its own bathroom and kitchen facilities, but no separate bedroom. 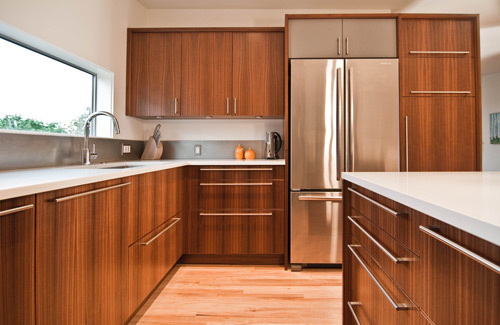 If you’ve some funds, you can get some swell built-ins to add to your space. 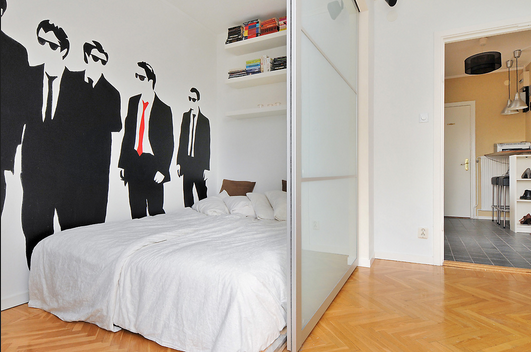 From Life Edited, here’s a suite in Warsaw, Poland for a mother, her son, and a dog. It’s just 237 square feet. the suite has “normal” height walls, it’s great to see someone doing something up high in that limited space. 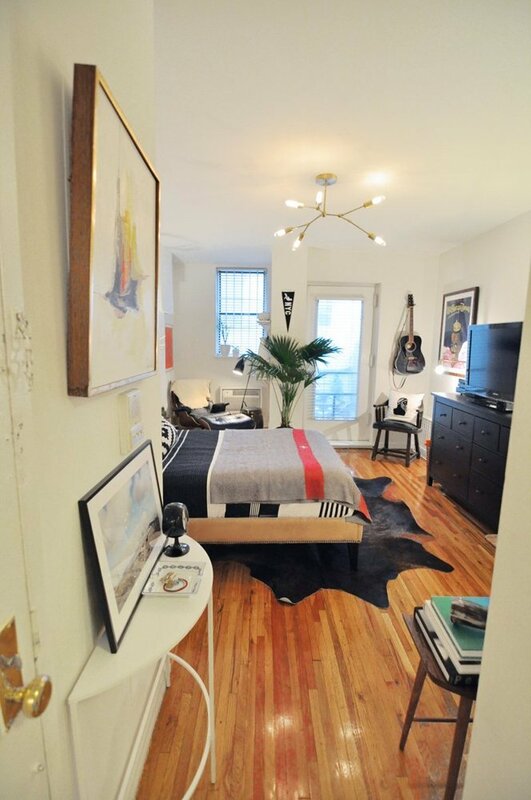 See the rest of this sweet suite at Apartment Therapy. 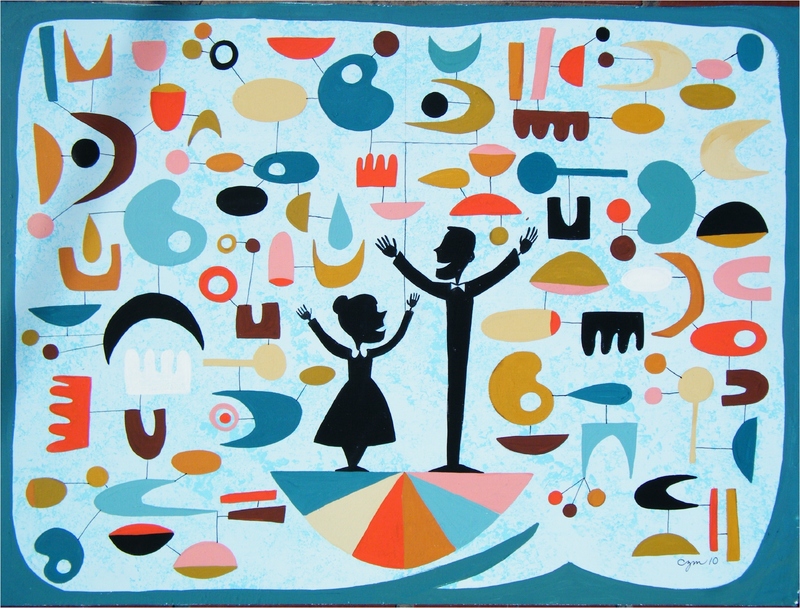 Isabelle is loaded with talent that way — check our her blog at Engineer Your Space. But you could incorporate a lot of her ideas into your studio even if you are not as handy (maybe you have a few handy friends?). There’s more ideas on fitting a bedroom into a living room here. The lesson I’m trying to jam down your throat here is that even if living smaller is not by choice (if, for example you have to live in a city with a tight housing market — I’m talking to you Hong Kong!) — you can still find a way to live comfortably in less space. As I repeat — Small is the new Black. Posted in Cities, Decorating, Housing, Small House and tagged Decor, Lane Home, Lane house, Laneway House, Small Style, Vancouver. Bookmark the permalink. I love our new bathroom. 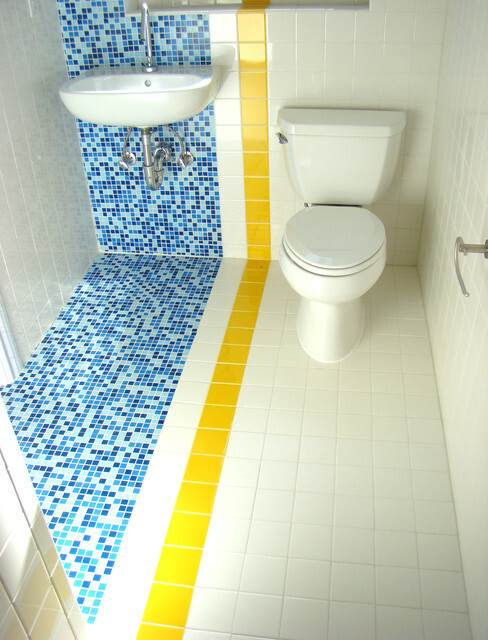 Although it’s not really a bath-room, as we don’t have a tub, just a glorious, tiled shower with a rain head. (Pictures? Not yet. Although the bathroom is nearly finished, we still have a couple of things that have to be fixed, and I won’t take pictures until it’s perfect. Just take my word on this for now). And she stacked two of them on one wall. 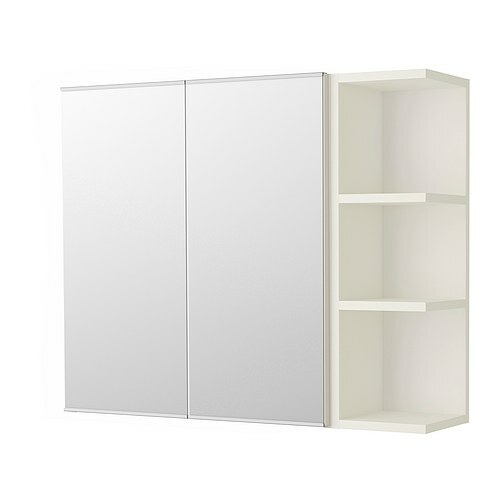 Giving us a full-length mirror and oodles of storage, with the mirrors flat against the rest of the wall. Well, there are ways of doing this. 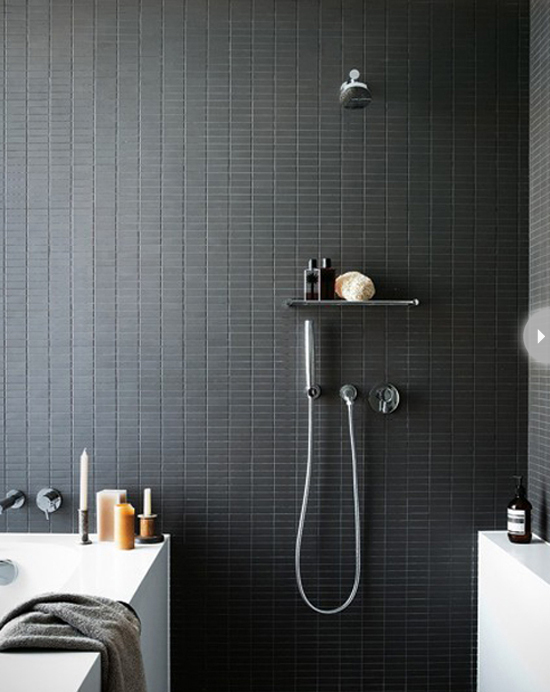 Houzz has 9 tips for fitting more into less space in the bath/shower room. 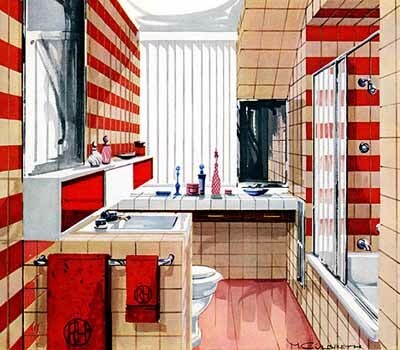 My favourite is the European style Wet Room. The whole room is the shower. 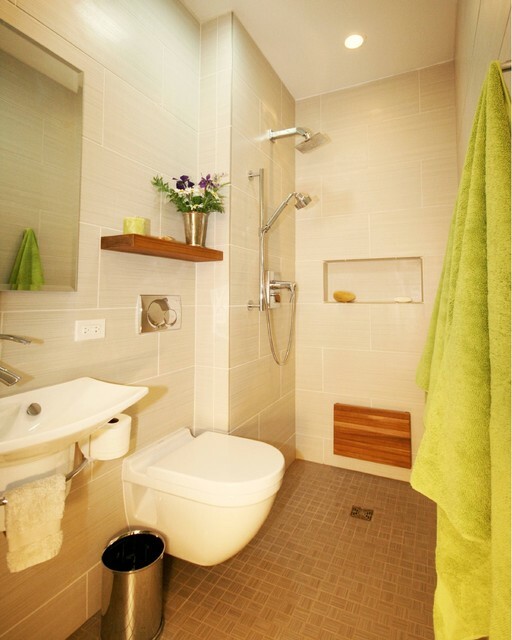 All the surfaces will need to be wiped down after your shower, but if it’s a teeny room that’s not a big deal. 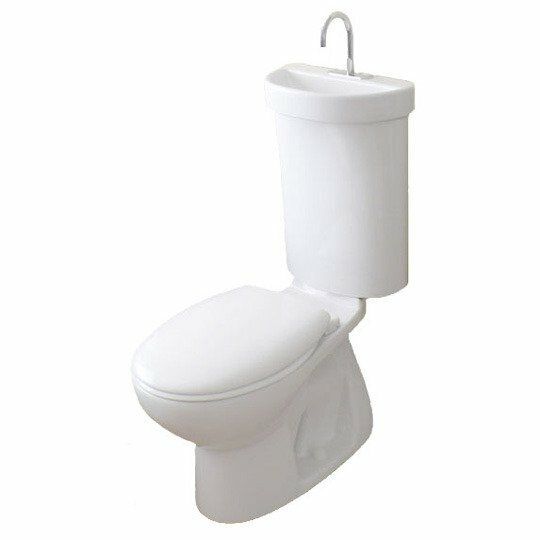 When inches count a wall-mounted toilet can really save space. We couldn’t do it because our toilet is set against an outside wall (full of insulation, etc.) And we have a regular sink, not this eensy weensy one. But that’s another way to save some space. 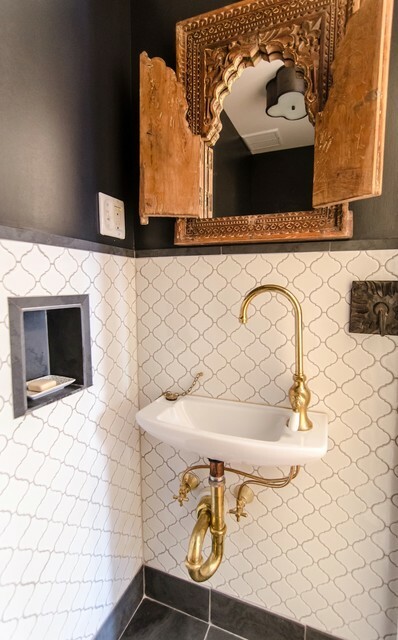 Apartment Therapy has some great little sinks — handsome, too! 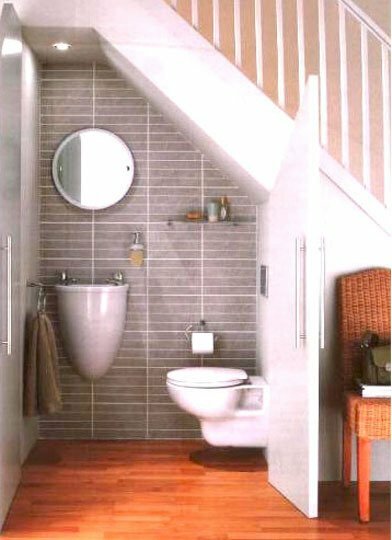 This one allows you to put a powder room under the stairs — great space saver. No room for a toilet and a sink? That’s what you think. 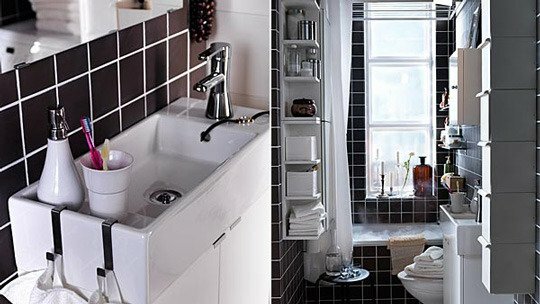 Small space solutions. Because small is the new black. (I just made that up but will be using it mercilessly in the future). Posted in Decorating, Housing, Laneway House, Small House and tagged Decor, Lane Home, Lane house, Laneway House, Small House, Small Style. Bookmark the permalink. DH and I took advantage of the unseasonably warm weather a couple of weekends ago to walk over to Commercial Drive and shop in some of the little stores that line that avenue. We started off our stroll by walking down the alley for about five blocks — and we found a laneway home on every block. All new, of course, all built under the former design rules with one-and-a-half stories and no outside parking pad, all looking very nice….and all looking very much the same. I can’t blame people for wanting to avoid the extra cost of designing their own laneway homes. And the Craftsman style that predominates is certainly handsome. But I am glad that some of the local builders are including new and innovative designs in their catalogues. The design has got lots of attention. I read about it in The Vancouver Sun, VanCity Buzz, Curbed, and Eater. There was even a letter to the editor in the Sun that worried about the house contributing to light pollution. That’s more fuss about one laneway house than I’ve seen since the early days (oh, those pioneer days of laneway housing — two years ago). I like the design, there are two versions of the plans, and I think it would be a welcome addition to any block. And, as I said, I am happy to see a different and innovative look available without a custom design. I don’t think I could live there (for one thing there is my proclivity to throw stones, and you know what they say….) it’s a little too bright — on a sunny day the light would pour in. But it’s a handsome house, a good use of space, and a nice different design. the interest and feasibility of introducing laneway and coach houses similar to those allowed by the City of Vancouver. Affordable housing is a problem throughout the entire Lower Mainland, not just in the city of Vancouver, so communities throughout the area are looking into a variety of solutions, and laneway housing is just one of them. New Westminster Council is discussing whether to go ahead with laneway housing or to wait and make it part of a much larger neighbourhood planning process currently planned for two years down the road. The more the merrier, say I. I believe fervently that laneway houses has a place in the mix of housing in any community. It’s true that they don’t dramatically reduce the need for affordable housing but they do relieve the under-supply of homes in the area. Fingers crossed the plan goes ahead. 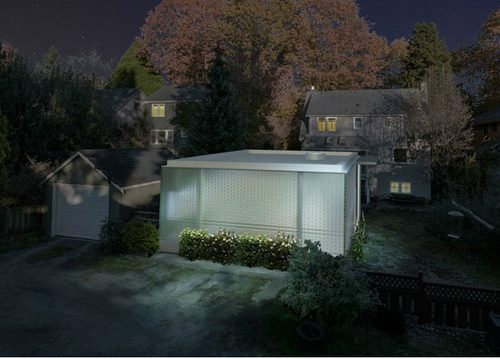 Posted in Cities, Housing, Laneway House and tagged glass house, Lane Home, Laneway House, Neighbourhoods, Small Style. Bookmark the permalink. The shelf guys were back this week to give us more space. They put in shelves in places we had hardly thought of — great horizontal spaces for us to put our stuff. And just moving boxes out of their way to install the shelves showed us once again — we have too much crap. Er, things. F’instance they installed a shelf under the kitchen sink so we can finally put our composting, recycling and garbage out of the way….and discovered we had stored bottles of carpet cleaner under the sink for the past 6 weeks. We don’t have any carpets. Ergo, we don’t need carpet cleaner. Into the recycling they went. editing, i.e. getting to that essential, irreducible quality…is something that takes time and great effort. What would my life look like in its most essential form? 1. Attention. Practice doing one thing at a time–whether it’s work, driving, reading or talking with a friend. No more watching TV while writing, reading, doing the crossword. Let’s concentrate on what we are doing. 2. Space. ask ourselves how we can make the most of the existing space and how we can remove any elements that don’t support how we live. 3. Clothing.Create a wardrobe where every item is our favorite. And that means no more shopping for shopping’s sake — even during the sales. 4. Food. eat less, but better–healthy, fresh food that supports longterm health, not immediate gratification. Now the holidays are over and all the candy/snacks/desserts are gone, let’s keep it that way until next December. The only food to grab and eat will be fruit. 5. Stuff. we might continually ask whether we need the stuff we have. Do we use it? Does our frequency and quality of use justify its residency in our lives? As we move things from our rental storage space to our laneway home we have to keep getting rid of things we don’t use and don’t need. Yes! 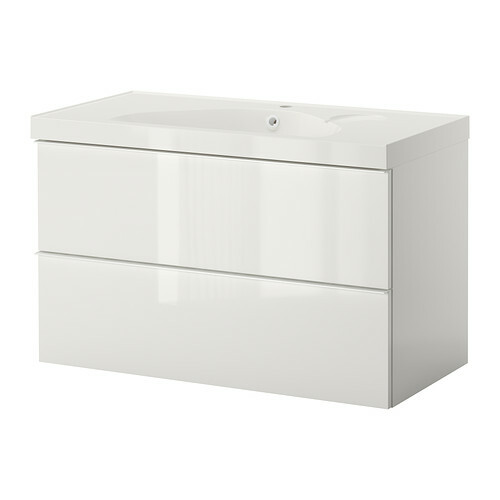 Everything we get rid of makes our lives simpler, more elegant, easier. And cleaner. Living a conscious, serene life. Isn’t that what we all want? Posted in Housing, Laneway House, Minimalism and tagged Decor, Lane Home, Lane house, Laneway House, Minimalism, Small Style. Bookmark the permalink. Keeping it cool – decluttering the fridge. While showing off our ootsy-cutesy home over the holidays, someone mentioned that their small fridge was driving them a bit crazy, as it was just too small to adequately hold their needed victuals between trips to the market. I didn’t see how it was an issue for us as we have three markets within easy walking distance, and we can replenish our little Blomberg quite easily and frequently — every day if we want. But guess what — now it’s an issue. Mostly because none of the local markets supplies small amounts of foodstuffs for couples with small fridges — they are used to stocking huge freezers with family-sized boxes and bags of food. Plus I just go a little nuts when I see some produce I like, so our eensy crisper gets filled up and spills over into the limited number of shelves. It’s a habit I must break myself of — right now I am wondering how I am going to get rid of a large bunch of kale and 3/4 of a head of cabbage since I’ve discovered that my cabbage/kale soup has a deleterious effect on DH’s digestive tract. I bought a lot because a) I like cabbage/kale soup, and b) it’s cheap (like borscht! only cheaper! ), and c) no one in the neighbourhood sells half a head of cabbage. Plus I find myself with a leek (they only came in bunches of 3) and half a sweet potato. I have learned my lesson, and will only get what we need from now on, and I am sure I will be able to clear out the fridge if I plan a few meals of leek/kale/sweet potato soup (it is a real thing) with cole slaw on the side. I’m usually quite good at planning meals — I customarily make a month’s plan of meals so we’re not repeating the old stand-bys and we’re trying new recipes. I just went off the rails with the move. It’s estimated that 40% of America’s food supply ends up in the trash. 10% of greenhouse emissions from developed countries is generated by the production of food that is never eaten. Yikes! This article from Life Edited came along just at the right time. It offers six tips for editing down your supplies, and preventing waste. As it suggests in the article, I buy food from the perimeter of the grocery store, the produce, meat, dairy, and bakery, and try to stay away from the processed food in the middle. And we save our scraps for the city’s compost scheme. Leftovers get taken to work for lunch. Avoid “precious” food. How many times have you bought special cheese, meat, heirloom tomatoes–whatever–and waited to use it for a special occasion, only for that food to end up rotting? Have a plan for your food–either eat it at an appointed time or immediately. Food spoils. Make every day a special occasion. Buy only what you need. This is a pretty obvious one, but try to buy the food and the quantities you know you’ll consume from one shopping trip to another. It’s okay to have an empty fridge before you go shopping. If feasible in your area, make more frequent, smaller shopping trips. Posted in Laneway House, Minimalism, Small House. Bookmark the permalink.